I have reached the stage where Isherwood’s fictional oeuvre has progressed from social realism and the study of identity in a familial setting to an extremely personal perception of the possibility of transcendence. 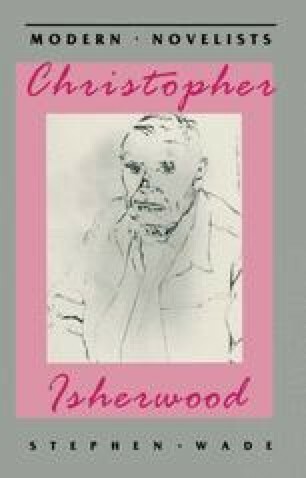 As his writing life continued, he always used fiction as an alternative to autobiography for the judgement of experience, and always at the centre of his fiction is the Isherwood surrogate who has grown imaginatively from the original thoughts and events of diary notes. His interviews always suggest the closeness of diary and fiction; and of course his recent autobiographical works have had diaries as source material. In his last two novels we have his most profound statements about the polarities of self which have been important in this study: the physical and spiritual in man. In the previous section, transcendental experience was contrasted with the materialist and sensual human motivations, but no real study of the self identity that is perceived outside social ties and is demarcated by physical being had been attempted in earlier fiction. In A Single Man he attempts this.